Premium 1UP Brand Full Height Pop Up Displays are USA MADE since 1999 exclusively by Affordable Exhibit Displays. Packages include Velcro-Ready Fabric Panels or Custom Printed Graphic Panels, Wheeled Shipping Cases, optional Monitor Mounts, Tablet Mounts, Podium Kits and LED Lighting. Premium Full Height Pop-Up Display Package Includes Complete Set of Velcro Receptive Fabric Panels & Wheeled Shipping Case. Set-up size: 4' wide x 90" tall. Premium Full Height Pop-Up Display Package Includes Custom Graphic Center Panel, Velcro Receptive Fabric End Caps & Wheeled Shipping Case. Set-up size: 4' wide x 90" tall. Premium Full Height Pop-Up Display Package Includes Custom Graphic Center Panel, Custom Graphic End Caps & Wheeled Shipping Case. Set-up size: 4' wide x 90" tall. Premium Full Height Pop-Up Display Package Includes Complete Set of Velcro Receptive Fabric Panels & Wheeled Shipping Case. Set-up size: 6' wide x 90" tall. Premium Full Height Pop-Up Display Package Includes Custom Graphic Center Panels, Velcro Receptive Fabric End Caps & Wheeled Shipping Case. Set-up size: 6' wide x 90" tall. Premium Full Height Pop-Up Display Package Includes Custom Graphic Center Panels, Custom Graphic End Caps & Wheeled Shipping Case. Set-up size: 6' wide x 90" tall. Premium Full Height Pop-Up Display Package Includes Complete Set of Velcro Receptive Fabric Panels & Wheeled Shipping Cases. Set-up size: 8' wide x 90" tall. Premium Full Height Pop-Up Display Package Includes Custom Graphic Center Panels, Velcro Receptive Fabric End Caps & Wheeled Shipping Cases. Set-up size: 8' wide x 90" tall. Premium Full Height Pop-Up Display Package Includes Custom Graphic Center Panels, Custom Graphic End Caps & Wheeled Shipping Cases. Set-up size: 8' wide x 90" tall. Premium Gullwing Full Height Pop-Up Display Package Includes Custom Graphic Center Panels, Custom Graphic Connecting Panel, Custom Graphic End Caps & Wheeled Shipping Cases. Set-up size: 20' wide x 90" tall. Premium Gullwing Full Height Pop-Up Display Media Package Includes (2) Monitor Mount Kits, Custom Graphic Center Panels, Custom Graphic Connecting Panel, Custom Graphic End Caps & Wheeled Shipping Cases. Set-up size: 20' wide x 90" tall. *Monitors not included. 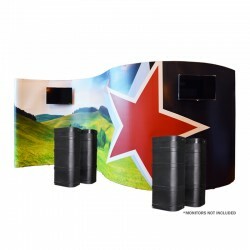 Premium Straight Full Height Pop-Up Display Package Includes Custom Graphic Center Panels, Custom Graphic Connecting Panel, Custom Graphic End Caps & Wheeled Shipping Cases. Set-up size: 20' wide x 90" tall. 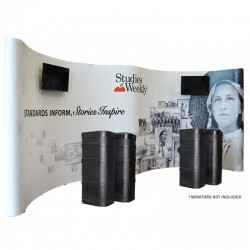 Premium Straight Full Height Pop-Up Display Media Package Includes (2) Monitor Mount Kits, Custom Graphic Center Panels, Custom Graphic Connecting Panel, Custom Graphic End Caps & Wheeled Shipping Cases. Set-up size: 20' wide x 90" tall. *Monitors not included. Premium Serpentine Full Height Pop-Up Display Package Includes Custom Graphic Center Panels, Custom Graphic Connecting Panel, Custom Graphic End Caps & Wheeled Shipping Cases. Set-up size: 20' wide x 90" tall. Premium Serpentine Full Height Pop-Up Display Media Package Includes (2) Monitor Mount Kits, Custom Graphic Center Panels, Custom Graphic Connecting Panel, Custom Graphic End Caps & Wheeled Shipping Cases. Set-up size: 20' wide x 90" tall. *Monitors not included. Premium Full Height Pop-Up Display Media Package Includes (1) Monitor Mount Kit, Custom Graphic Center Panels, Custom Graphic End Caps & Wheeled Shipping Case. Set-up size: 6' wide x 90" tall. *Monitor not included. Premium Full Height Pop-Up Display Media Package Includes (1) Monitor Mount Kit, Custom Graphic Center Panels, Custom Graphic End Caps & Wheeled Shipping Cases. Set-up size: 8' wide x 90" tall. *Monitor not included. 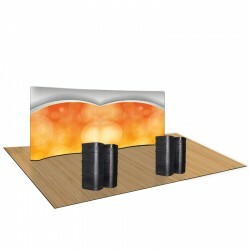 Premium Full Height Pop-Up Display Package Includes Complete Set of Velcro Receptive Fabric Panels & Wheeled Shipping Case. Set-up size: 6'9" wide x 90" tall. 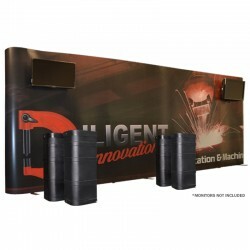 Premium Full Height Pop-Up Display Package Includes Custom Graphic Center Panels, Custom Graphic End Caps & Wheeled Shipping Case. Set-up size: 6'9" wide x 90" tall. Made in the U.S.A by Affordable Exhibit Displays since 1999, our 1UP brand pop up display has been a longstanding staple at trade shows all across the country and world. Piece by piece, we assemble every 1UP pop up display by hand insuring the ultimate in durability and satisfaction with every order. Our 1UP pop up display is available in table top models and full height floor models in widths such as our 4ft wide tower model, 6ft wide floor model, 8ft wide floor model, 10ft wide floor model, 16ft wide floor model, interactive media packages and 20ft wide floor model. You can always expect high-quality control with this pop up display. Using the best available materials for construction, we do not cut corners. Whether you choose our Premier Velcro-Ready fabric panels or high resolution graphic panels, both options are backed with heat resistant polycarbonate guaranteed for decades of use. This polycarbonate backing ensures your panels are unaffected by high heat and will not deform - like in the trunk of a car or warehouse. We use 1/2" square aluminum frame components to ensure the frame is strong and rugged for a lifetime of usage. Some of our competitors may use round tubing that is more susceptible to bending, which means problems for you. The better product we develop the better end results the end user will receive. We aim for a trouble free life for your display that's why we offer a Lifetime "No Questions Asked" Warranty on the 1UP frame components. Everyone wants good quality results - not only at the time of purchase but for the future as well. The quality continues with our proprietary shipping cases as well. You won't find these roto-molded shipping cases anywhere else. We developed our cases to included heavy duty built-in rubber wheels as well as a recessed lid that fastens with cotter pins for easy access to your pop up display components. You'll never need to worry if your pop up display will arrive damaged with these cases. It's extras like these that only begin to tell you the unequaled quality of our 1UP pop up display brand. 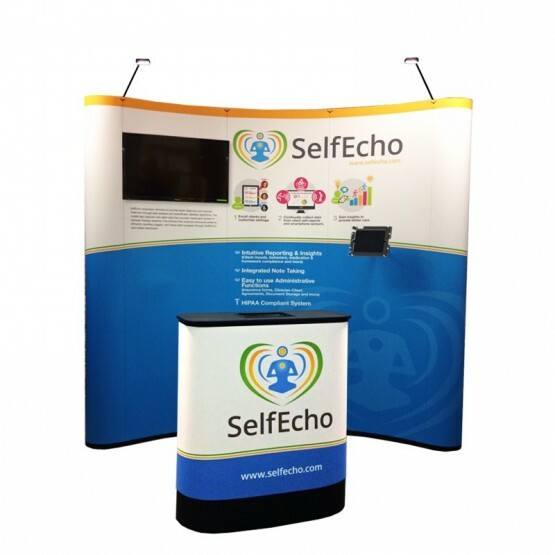 Affordable Displays does not just sell tradeshow pop up displays, we also have a wide variety of banner stands and other exhibition displays. Conveniently providing in-house graphic printing and meticulously inspect all orders and graphics before they are shipped out, making certain that our clients are 100% satisfied. 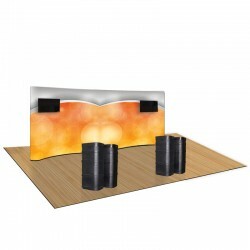 Start your shopping at AffordableDisplays.com and find an extensive selection of trade show displays, custom banners, table covers or banner stands here. Call 800-723.2050, chat or contact us and get started on your project today!